This is one of the traditional sweets influenced by the Maratha food made in Thanjavur. 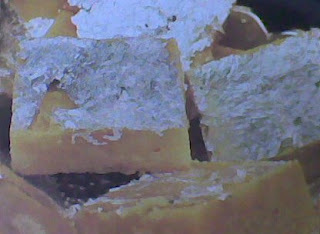 My Aunt is an expert in making this burfi and I came across this thru her. I had tried to make it many times but never got the consistency right before my marriage. When she visited me after my marriage when I was carrying Arjun She made me this sweet as it is my favorite. I learned it standing next to her and from then on I always do this sweet during the Diwalis and everybody just loves it in my home. The happiness that I feel when cutting the burfi into shapes is something that I could never explain. I feel so content and happy that I had passed out in something that I put my best. So here is the recipe…. Grate the bottlegourd and squeeze the water out. Soak the almonds in warm water. Remove the skin and slice them finely. Dissolve the saffron in 1 tbsp of milk and keep it ready. 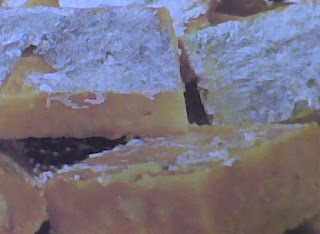 Grease a burfi tray with ghee and keep it at hand readily. Heat the ghee in a heavy bottom kadai. Add the grated and squeezed bottlegourd and sauté for over five minutes on medium flame. Now add the sugar and cook till it melts completely. Toss in the almonds and add the water. Cook continuously till the mixture begins to harden. Now add the dissolved saffron and rose water and mix well. Transfer the contents to the greased tray and set it out like a burfi. Level the top with either a plantain leaf or a wooden spatula evenly. Let it cool to the room temperature and decorate it with silver warq sheet. Cut it out into any shape you prefer and enjoy it to your heart’s content. This is off to Priti’s Festive Food – Diwali Celebration and to Mythreyee’s Sweet Series. looks perfect shape. and innovative one.